14. For some reason this still did not work. I am going to post pictures of all the Psi Destroyer actor and Death actor and see a solution can once and for all be found. 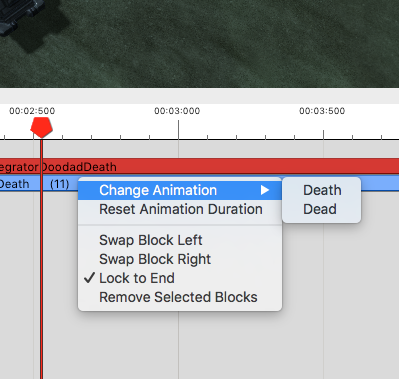 What happens is that the death animation plays half why then just cuts off. Same goes with the sound. This is the location that I put the death actor under in. I am not sure if it was supposed to be linked someplace else. These are the events on the Psi Destroyer Actor. Those two green events are for the wave though so its basically otherwise the default actor. This is the Psi Destroyer Death Actor. The Actor type is model addition. This is the Psi Destroyer Death Animation types. Death is the one where its falling apart. Dead is its last standing model basically. 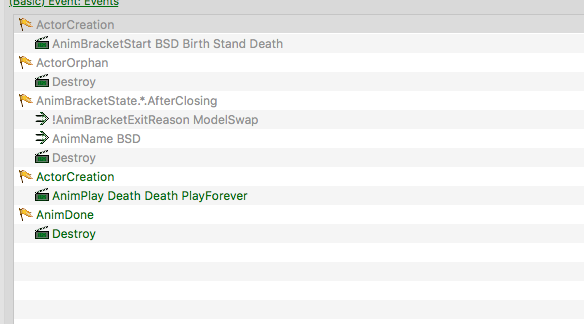 Now I wonder if I put something in the wrong field or I was supposed to add the death actor to another location as well. Maybe I am missing some important events for the main Psi Destroyer Actor. Hopefully this can be resolved. 1. Nanite Turrent raise and burrow animations as well as unit morph is working properly. 2. Figured out how to morph a whole bunch of buildings I did not expected I'd be able to figure out within the scope of this project and timeframe. 3. Tried your suggestion with the Hybrid training and it worked perfectly. 4. The Automated Refinery Animation has been fixed, when I used an Actor creation plus Animation Bracket Start event to fix it. However for some reason when I duplicate it, then it does not auto produce vespene. I am trying to do this for a black ops refinery. (which has its animations fixed as well). 5. I'll have a look at all the requirements and the show part. Now I'll get started with some of the more final issues I am trying to crack down on. These are listed in order of most important to least important. More specifically. 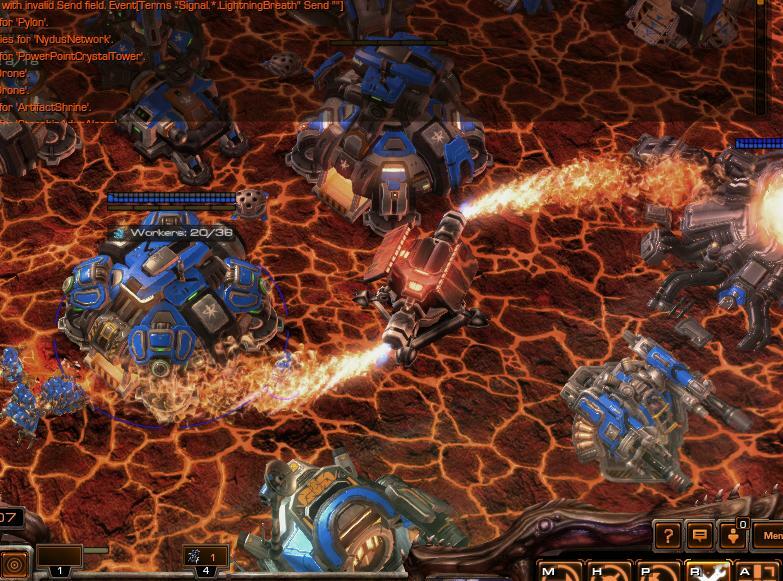 I want to make the char crashing barracks, debris, factory and battlecruiser models repeatedly fall when placing that Volcano you see in the first picture. I want them to continuously spawn and when crashing harm units within the vicinity. Similarly I wanted to do this with a number of other structures as well, but once I know how to do this with one, I can do it with the others. All the events starting at the first abili morph were ones that I created. The Death Actor is Tal'darim Energy Field Display. Nothing in that Actor's events itself has been added. I just basically need to know how to get the actor to be destroyed when it morphs back to the base model. If you need to have a look at the animation type. I can post a picture. Just don't want to make this too long. I am trying to get this model that you see in the model shooting flames to only cause damage within the area shooting flames right now. I already have a basic understanding of how to create, missiles, turrets, effects and behaviors, but most of the tutorials that I've found only explain how to create turrets that shoot and one specific target repeatedly(maybe with a bit of splash damage. 1. When it is unburrowed it automatically starts shooting flames whether or not an enemy is within the area. I want the burrowing and unburrowing to be manual(This part is discussed at number 4). 2. I want it to only damage units when they touch the flames with the proper burn model. The burn model I think I can figure out myself. Sticking to these 2 key things for now. The method I am using a bit similar to the one I used to get the Nanite Turret and Tal'darim Shield Generator morphs working. Currently does not have an ability morph back yet since I am just trying to get the turret to burrow properly. I wanted an explanation of what the various flags do and the difference between automatic, duration and time scale. Also wanted to know what time variant does. Play forever and play once is pretty obvious. Edit: Currently just about solved the issue with the flame turret as I realized the animation brackets were basically broken. They needed to be kept within one another. Issues I am having now though is that when I use the animation bracket stop for the flame turret to unburrow, it unburrows instantly. I wanted to know what I could do to slow the animation down for that specific time. Death actor goes under the Combat: Custom Death - Actor Model or Combat: Death Actor Model fields. No wonder it is not working. 6A. For best randomization is to use triggers else use multiple nested Create Persistent effects with diminishing circular offsets. Impact wise use a Create Persistent effect that creates the visuals with a final effect calibrated to the visual impact time that uses a splash Damage effect. Use the Pass Chance term for the actors to model swap to or create specific models using a Model type actor. The crashing structure models were unique to the first char mission of WOL. They are specific models and not easy to implement without model editing. 6B. Next to you having based the actor off the Zurvan actor and it has an actor specific signal that is orphaned the picture is uninformative. Also you are morphing too many units from a single unit. With morphs they count all abilities from the origin unit all the way back to the original unit. If you want a unit that morphs with a tree of over 64 abilities then after finishing morping to the placement unit you need to destroy it and then use a Create Unit effect or triggers to make a new unit so the abilities of that unit do not count towards the cap. What are the shield creation events under the actor? What events are used to destroy it? I assume in the picture the second to bottom one is used to create it. The shield should be a Model type actor! Under the Unit type actor for the structure when the morph completes there should be an event that creates the Shield visual Model actor. On Morph start away from the shield generating structure it should send a signal to the target of the ID for the shield Model actor to which the Model actor responds by showing the death animation before self destructing (timer system might be best?). 6C. The nova turrets work by having a circling Create Persistent that then uses linear offset Create Persistent effects that deal the damage. The flames are just Model actors and can be scaled although they will inherit the scale of the parent actor unless you disable the flags under the two Inherited fields. I may be wrong though since I have not yet looked at that system in detail. Still most newer flame thrower models are particle emitters. 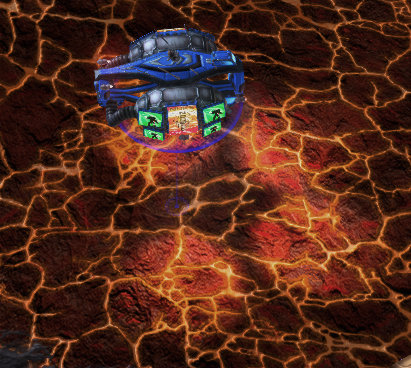 So you want an innate behaviour on the unit it morphs into when unburrowing that shoots flames. With part B you will need to adjust the animation speed based on the distance travelled to make calibration to the damage easier. 6D. When it burrows I think you mean apply the animation bracket and you only remove it when unbirrowing. I will not comment on if you have the right animation. My advice is look at how the perdition turret actor is set up. 7. No clue about the top two. Number 3 is that it is specific for the animation name flags so that it does not accept suffix name tags (eg. variations). Instant means it does not add to the animation queue. No idea about Number 5 but number 6 is when the animation is looping (eg. 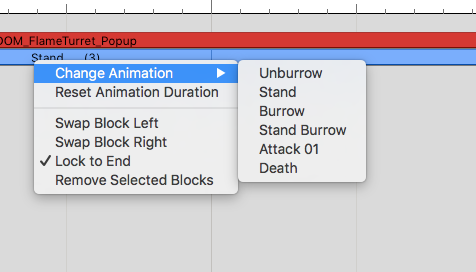 Stand) it overrides the animation to stop at the end. With the Play Forever flag it makes non-looping animations loop (although there usually is a glitch segment where it goes back the start). The Time Variant is based on the Time Type. This can be used that the animation only plays for a specific duration either speeding it up to fill the time slot or only playing a fragment until the cutoff time. 8. With regards to the animations of unburrowing most actors have a speperate animation for burrowing/unburrowing/work. Check all animations of your actor incase it has those. also check if there are any .m3a files for it under the mod. The behaviors are copied from the Psi Destroyer behaviors and altered for a fire damage model. Otherwise there is no other behaviors. My nest question is about what might be the best way to nest these create persistent effects? I am also going to look into triggers. Started watching some tutorials on triggers today. This is one of the first things I am about to look into. I think I get an idea of where to start with the rest of the things you've said at the part. As for the difficulty. Oh yes it does feel very daunting, but I am down for the challenge. Most of the complicates as mentioned prior just lie with getting the structures working properly. Most of the units for the mod are already working as supposed to. Lets hope I can nail this. 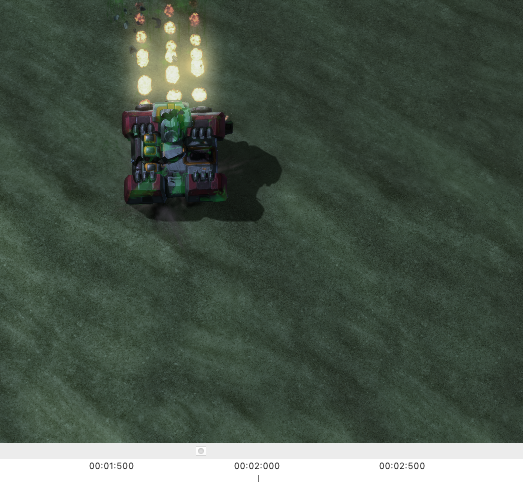 For the crashing debris you need to add a Buff behaviour that uses a periodic Create Persistent effect with the Effect: Period Count set to how many debris will crash at once per wave and the Effect: Flags field set to Random Offset. It is optional that you can have a long list of differing periods and use the Random Period flag to offset the creation of the debris slightly. Under the Effect: Periodic Offsets field you are limited to 32 values so place the offsets in a circle at a radius. From this Create Persistent effect you use other Create Persistent effects as the Effect: Period Effects. These effects have only a single period that is instant and have a circle of periodic offsets at a slightly smaller radius. Repeat this 3-5 times using radius values that do not have a common denominator (prime numbers are good) and that the sum of all the radius values is the radius of the area the debris are to fall in. The final randomisation Create Persistent effect uses a Create Persistent that is used for the debris actor creation/impact delay and uses a Damage effect as the final effect. Basically the nested persistent offsets cover any holes between the previous layer of offsets. One downside of this method is it does tend to give a Gaussian distribution. I advise studying the Archangel boss fight from HOTS since that uses triggers to determine the random locations to launch missiles at. Here is the progress so far. I have a create persistent effect and spawn unit effect created as well as the behavior. The crashing barracks are spawning regularly and I've found out how to regulate how many drop, but for some reason they aren't random offsetting and they all spiral directly toward the point created. Here is a look at what happens. This is a look at the crashing debris persistent effect. 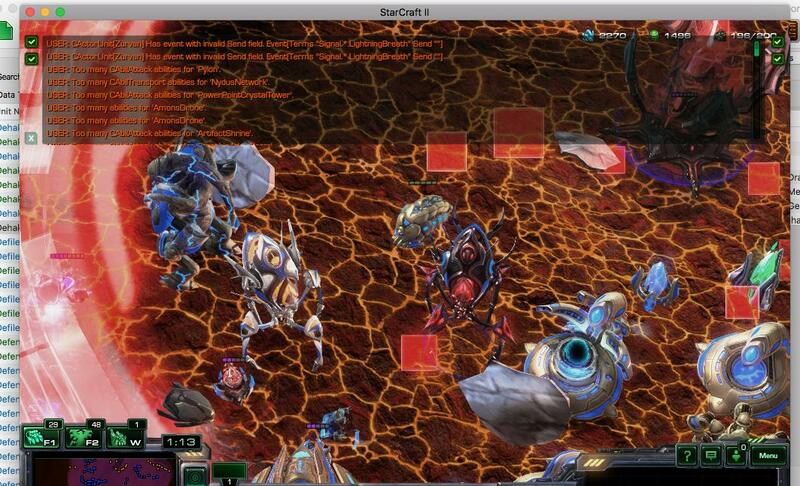 This is a look at the unit spawner. I also have another simple question real quick. I usually prefer to wait till I get many important issues resolved before asking more, but this is an important one. I am trying to get the mod ready to be reasonable playable and out for beta. What I want to do is fix the icons. 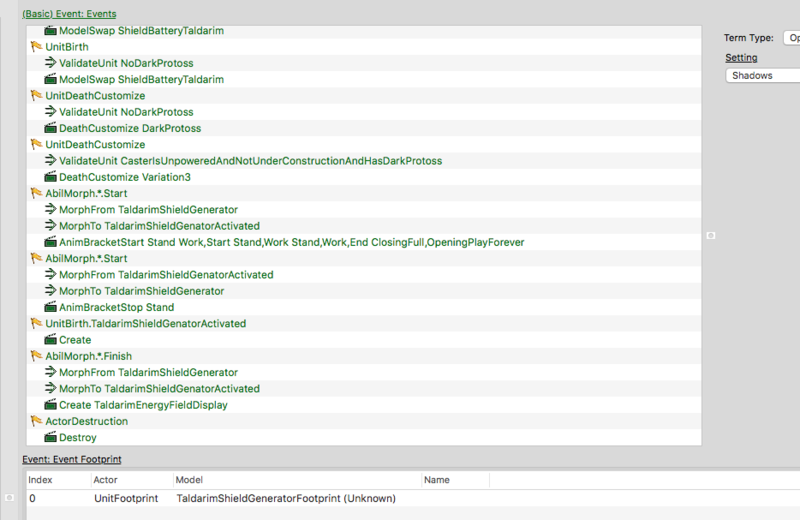 So far what I've been doing is taking snapshots of structures I am using. I want to know how I can transfer these structures into the game so they can be used as icons and buttons. That is why you have several Create Persistent effects in a chain. The first ones change the offset while the final one is the crash. Why you even spawning units? Do you want them to be able to be shot down? Convert your image to the .dds format using some program like Aorta and then import them. Okay I am going to give that a try. As for the spawning units. I am not deeply knowledgable about how these sorts of effects work and how to get all these things set up although I am very much putting a big effort into learning how. When I had a look at the effect field, it seemed to be asking for another effect so I tried a spawn unit effect, but I don't want them to be able to shot down. How does one get the visual to be produced without using a spawn unit effect? Now my primary reason though for the structures is because I want to create a structure that just causes hazards within a certain area. I did not want them to be able to be shot down, but just present hazards for players walking into the area. Skip the Create Unit effect altogether. Like the drop pods for trained units you use a Model type actor created by the effect. 1. Sadly to the Death animation still is not functioning properly. I tried putting the death actor into all fields and adding events. Now what I am thinking of doing is that if I can't get it to work, just putting in some sort of effect that plays upon death to fill in the disappearance. I've managed to get some effects to appear with unit death>create such and such. What I am also going to do is investigate the Psi Destroyer very through ally from everything connected to it to just the mosts simple things to see if I can find anything that might be causing this. I wonder if it could have anything to do with the animation events? 6B. Thank you for letting me know about the Zurvan issue. I will look into it. As for the issue with the Shield Battery. I think that advice may just solve the issue. As soon as I am finished reinstalling sc2, I am going to give it a try. 6C. This one I am going to come back to since I would like to make some more attempts at this myself and investigate it further before asking anymore on it. Good to have some progress done first. 6 and 8 are fixed. Good to know about 7 now. I like to know what I am dealing with. 1. In regards to the Nova Eradicator. That one which plays during the miner excabition mission. I am using that in the mod and for the most part, it already works just as I'd like it to for now, but there is an issue when it uses is flamethrower ability. When this ability is activated, the upper half of the eradicator always keeps its body turned in the direction of the flame thrower and one cannot turn the flame thrower based on the direction the eradicator turns. I wondered how to go about fixing this. Sadly no pictures at the moment cause Sc2 is reinstalling(ran into an issue after an update). If pictures are necessary, I should be able to post some in a few hours. 2. Another issue with the eradicator. It has two behaviors that causes it to push units and structures. Right off hand I cannot remember the name, I can check later though for the exact one. This is probably really easy to fix, but I wondered how one would prevent these behaviors from pushing certain types of structures and units. Like for example. I don't want the eradicator, to be able to push bases or vespense geysers out of position and made prevent massive type enemies from being pushed. 3. Now a question about weapons. Recently I found out how to tint units using the SetTint Color. I've found this somewhat useful for coming up with variations of new units, but what I really would love to know is if its possible to tint weapons as well. I looked under the mode itself and could not find a set tint option. I tried using the event "Weapon start > SetTintColor" On the weapon actor. Did not seem to work. Maybe I am going about it the wrong way. 4.1 and 2 Now I have 2 questions about creep again. First question is if this might be possible. Could it be possible to use a create persistent effect along with a search effect to change the texture of all creep in such and such a radius? I also wondered if I similar thing could be done to change change the tint of creep within a certain area. For now this is all I can think of in terms of unit related issues that I am not aware of how to get fixed. 1. Do not forget to check for any Macro actors. 1. From what I can tell the ability adds a buff behaviour that then uses a Create Persistent effect to use a search at an offset in front of the unit. Could you send me a picture of the problem? From the actors all I can tell is that the upper body uses a turret to turn in the direction of the attack target but the flamethrower just goes straight in front relative to the turret. There are two options, either make it a weapon like the hellion so that the turret will turn to face what the flamethrower is attacking or use a Modify Unit effect to force the turret to face the correct target. Also instead of using a buff you could use a Create Persistent effect at the target unit and use an Effect - Target ability. 2. That is the Unstoppable buff flag in action. Replace it with a high Movement: Push Priority under the Units data type. 3. I prefer Texture Select By Id combined with Set Tint Color myself. Yes it is possible you just need to add it to the actor events of the actor used for the Launch/Impact/Beam visuals used by the Action actor for the weapon. For example to change the colour of a marine firing the Generic Attack Launch Model under the Combat: Launch Model field of the Action actor would need to be replaced with one that has the Actor Creation event leading to the Set Tint Color action. 4. No. You can only overlay splat models using Splat or Model type actors which can hide but not remove the original creep texture. If you used a retextured splat you can use it to act as a colour filter for an area of creep. Alright. Was busy past two days. Can finally get back to figuring this issue out. So here is the update. On the second row, you notice 2 blank buttons. One focuses the upper half of the eradicator in one direction while the second one sets it to default. This is good because it means that using the Eradicator will take some more macro. Now one thing I was noticing is that the eradicator railgun ability shoots instantly, but it looks like its supposed to shoot with a precursor effect to warn the player prior to this. Before I decide that I want to add this to the eradicator though, I want to see how the current balance of the game would be with this thing as it is. The eradicator does not have a constant basic attack, but I am fine with it that way. 2. Going to give this a try. 3. I am going to give this a try now that I have some time available again. 4. Np. Once I am done finishing the essentials of the mod, I'll look into this possibility deeply. 5. Another question I had was about Faction Customization screens. In the mod I am making I'd like players to be able to pick between 3 factions of a type of race, depending on what they picked in the lobby. I am already aware about how to get a Ui Custom Screens to show up when the game starts. What I am not sure about though is how to get the player a specific base or structure with a certain type of workers mining when clicking on a ui button. This may be pretty complicated. Maybe its actually super easy. I am not sure if I should post about this in the trigger section. A countdown for all players to select a faction needs to be present as well. This I am unclear about as well. Edit: One more question is, how does one add multiple requirements for building one structure? I want the player to have to set up 3 power links before they can set up a Psi Destroyer. 5. The campaign use upgrades added or removed by catalog triggers. You basically use the UI/Dialog buttons to set various variables that triggers then use to create the player units on "game start" (when players have all made their choices). You need either a timeout or to just remove players from the condition pool if they drop. Either way the timer will probably be UI/Dialog again. Use a Dialog and reset the text every tick based on the integer value of a variable. And the picture shows my current setup looks like. At this point a box on the screen is suppose to appear. I stopped here because no box is appearing. 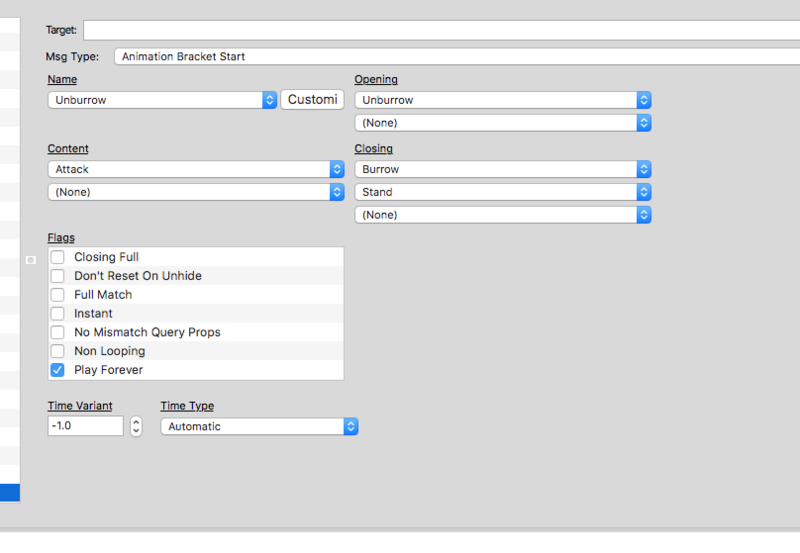 Now one thing to note is that when I started up the trigger editor, I did not see any melee initialization trigger. I tried to create my own as seen here, but it says in the video that a number of things need to be deleted otherwise the ui won't show up. I want to know what I might be doing wrong and where exactly I find the in game melee initialization trigger. Other question which I meant to ask last time is about how someone goes about setting multiple requirements. I'd like to have it so that 3 types of a certain building need to be build in order to build a certain building and also multiple different types of buildings required. Dialogs are created as hidden. You need to show it using a Show/Hide Dialog action. The default melee triggers should be in the lower left box of the screen. Under the view menu make sure the Show List Panel and Show Triggers options are enabled. A simple test to see if the melee initiazlization trigger still exists is to test the map with no player start locations placed or other town centre structures and see if the game is won/lost on map start. Under the Use part of the requirement use an And node under which you place multiple Count Unit nodes. Under the Alias field set specific structures or use the Tech Tree: Tech Alias string you have given to a group of equivalent structure units for the requirement and under the State field set it to Completed. For a more complex setup use Greater Than Or Equals To nodes under the And node each comparing the number of one structure type against a Constant. 1. I would like to know how someone properly duplicates a weapon. There is a lot of new weapons that I want to make similar versions of for existing things in the game such as the Tal'darim Doomcrawler Custom Model. I to have a version of the Reaver weapon tinted red and adjusting the damage and other stats a bit. Whenever I duplicate a weapon though, some of the actors remains connected to the new one and some of the new actors connect to the old one. 2. With number 1. Same goes with abilities. 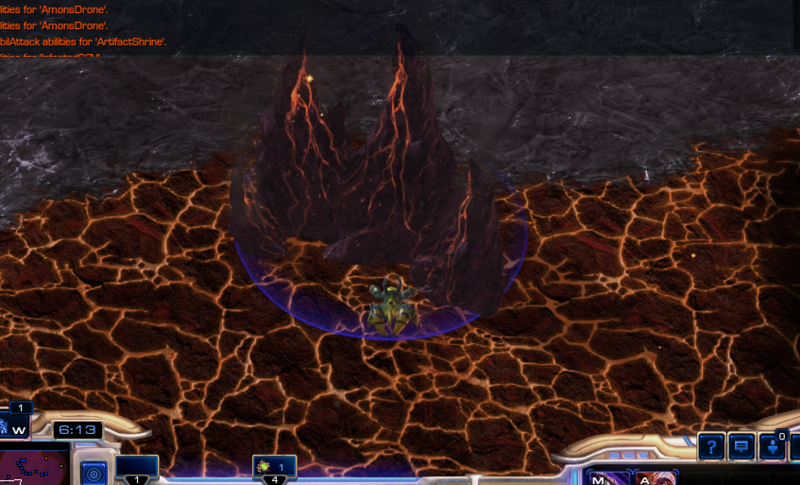 Right now I am trying to make the D8 charge on reaper drop mini nukes instead with blue fire(no precursor). I need to know how to properly replicate abilities to adjust the stats and damage. Maybe if you know a tutorial somewhere for 1 and 2? 3. Next thing I wanted to know was how someone allows a command center to train 2 units at once? 4. Another problem I am having is with the 3 probes on my command card. However these are the requirement nodes remaining in the nexus. I am not sure how to unlink these from the nexus. There is a few other issues, but I am going to try not to overcomplicate things this time by taking too many on at once. EDIT: I figured out how to properly duplicate weapons without too much issues then edit them. Still need help with abilities though. 1. I prefer to copy and paste individual data elements since duping sometimes does stupid stuff. Look at the actors connected to the old weapon still and find out why and change it. Usually has to do with the actor events that are not token related. 2. The damage of abilities always is a Damage type effect usually at the end of the effect tree. Again copy and paste from the start of the effect tree working your way down changing fields as needed. Weapons have an effect field and so do Effect - Target abilities otherwise their workings are the same. 3. The number of units a structure trains at once if determined by the Queue type ability it has. 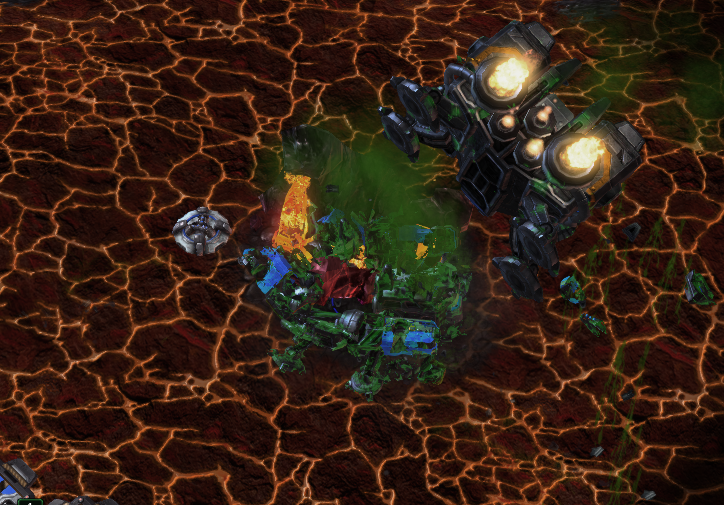 Buff behaviours can also adjust the number of units trained at once (eg the terran Reactor). 4. Outside the test map are the triggers giving you the upgrades to enable the probe variant? What requirement does the Train ability being used to construct the probe have? Those nodes are counting that the player has a nexus. Therefore are unrelated to your problem. 1 and 2 are carefully noted. 3 Okay I think this will solve the issue. 4. There are no Requirements set for training that probe at the time, but as for triggering giving upgrades to enable the probe variant. This could be the culprit as I don't think there is triggers to enable them. Strangely though this is only happening with the Nexus. How would I go about using triggers to enable the probe variant. Meanwhile I am going to look further for clues as to what could be the problem. Start looking at the Train ability you are using to make the probe variant. What is the Ability: Info - Button - State field set to for the slot used to make that probe variant. Is the command card on the Nexus linked to the ability correctly? There are three options. 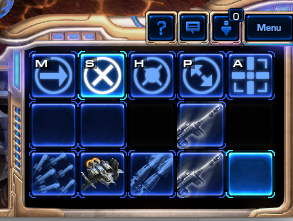 You can use triggers to give the player an upgrade that requirements under the Train ability recognise to show the correct slot and have all buttons for variants of a unit stacked in the same command card position. You can give the base unit an automatic Morph ability that uses the requirement and have the upgrade modify the button, tech tree and tooltips. Finally you can use Catalog Field Value Set trigger actions to modify the Train ability (like an upgrade can) and change the unit, training time, requirements and button for the slot as needed. Below is a link to an old video tutorial. 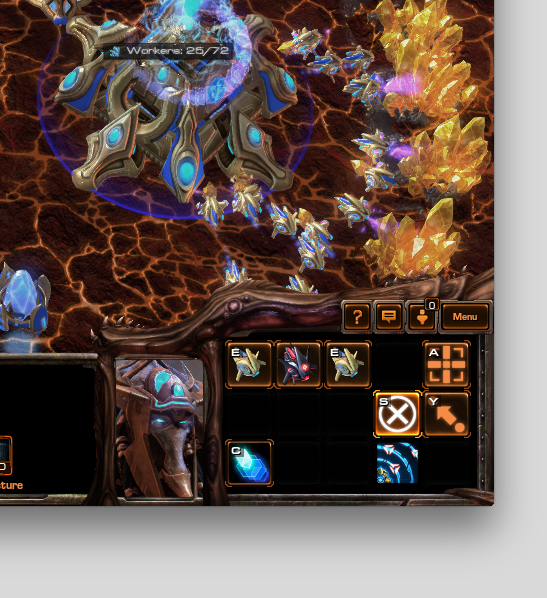 Also look at the Void - Tech Unit - Have Void Reaver (Colossus Upgrade) as an example. 1.1 For starters. I am trying to make the Gigablossom Flower attack using Kraith's Spine Volley(as seen in picture). Now I already have got it working although I am aware if I want to edit the weapon, I will need to make another version of it. Now the problem is that its launch point is much too low. It launches the spines below the flower and between the legs of the tree. I want it to launch them from the flower part of the tree. I tried raising the z offset of the launch point on the model actor of the missile and also tried using a local offset on the missile actor as well as changing turrets. None of that worked. 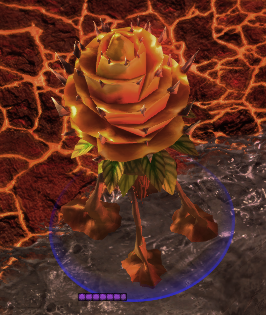 1.2 Next question about the Gigablossom flower is that I want it to automatically start attacking enemies when enemies come near it in a similar nature that the spore crawler does. Currently the attack only happens when triggered by an ability. 2. Next I am wondering how to add a visual range to detectors. On this Blimp, I have the overseer detector. I have already confirmed that the detector works, but there is no visual range circle showing. I wondered how one would get something like this to show up. 3. Next question I wondered is how one could get files exported and loaded into blender. There is a number of textures on some models that I wish to change and I want to see if I can make an attempt and adding some animations to those doodad turrets I spoke to you earlier about. Currently I am using a Mac, but I have up to date parallels. 1.1 sounds like the Action actor used for the attack is trying to use an attachment point that does not exist on that model so is defaulting to the origin. You first need to check that the Action actor is working correctly (do the missiles hug the ground or not) and then under the SOps for the launch site you need to add a SOp (Local Offset) SOp and maybe a SOp (Random Point In Sphere). 1.2 As a weapon or as an ability? If it is as a weapon you need to give the unit an Attack ability. If it is to use it as an ability you will need to adjust the Auto Cast fields of the ability and set the flags under the Stats: Flags field. 1.3 Check the filters on any Search Area effects and Damage effects used by the ability. Make sure that Player and maybe Ally are excluded. 2. Use Range type actors. They are usually created when the detector behaviour is on and destroyed when it is off. 3. With textures find the texture of the model you want to alter using the Cutscenes Editor under the Show Model Data option and then go to the Textures data type, click the File field and then the Browse button. Find the texture and then Right Click it and select the Export File option. Use software like Aorta to convert it into a more convenient file format and then use something like Gimp to modify it before converting it back into .dds format. Import the modified textures using the Import Manager (F9) of the editor, save, close and reopen the editor and reload your map. You can then use the Texture Select By ID method to swap the textures on the model. 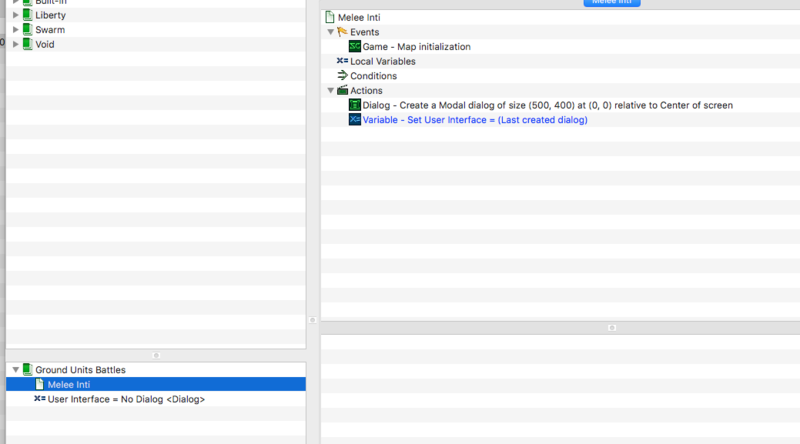 To export models go to the Models data type and click the Art: Model field and then the Browse button. 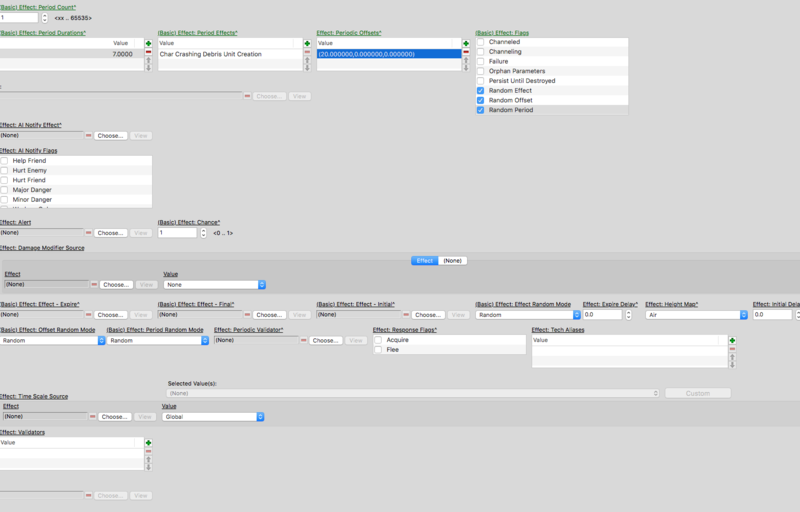 Find the model you want and then Right Click it and select the Export File option. You can then import it into the software of your choice and import it back into the editor like you did for the textures. If you just want to modify the texture just use the Texture Select By ID method as importing a whole model just for a texture swap consumes unnecessary file space. Also if you want to just add animations use .m3a format files since those only consist of animation instructions without the polygons and can be added to existing models under the Models data type.